No, this is not a book/DVD release of an old silent movie like Edison’s Frankenstein. It’s actually the unauthorized sequel to H.G. Wells’ classic novel, The War of the Worlds! The year was 1898. Wells’ alien invasion classic had been published in complete book form after being serialized the year before in Pearson’s Magazine. During that same time, an unauthorized version of the story was serialized in a New York newspaper and 1898 saw another unauthorized serialization published by the Boston Post, that was retitled as Fighters from Mars. In both cases, each of the pirated versions changed the setting of the story to the city the newspaper was published in, something that only increased Wells’ dismay over the unauthorized works. Although such flagrant acts of intellectual property theft might seem mind-boggling, such things were all too common in America during that time. Bootleg books were a big business back then, with the USA being the 19th century equivalent of China today when it comes to unauthorized DVDs. Despite pleas from famed authors like Charles Dickens, a combination of isolationists and those who profited from said bootlegs successfully pushed for the government to refuse signing any international copyright agreements. In fact, it was not until about 1988 that the United States signed onto the Berne Convention, which had been in existence since 1886! Getting back on topic, the success of these altered versions was popular enough to warrant a sequel. However, accounts vary as to which version led to the creation of Edison’s Conquest of Mars. Several sources credit the Fighters from Mars version, which would imply that the Boston Post commissioned it. However, other sources claim that it was published in the New York Evening Journal and thereby imply that it is actually a sequel to the version set in the Big Apple. 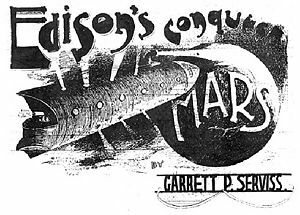 In any case, astronomy columnist Garrett P. Serviss was approached to write it, presumably due to his “talent for explaining scientific details in a way that made them clear to the ordinary reader.” In writing of his tale of humanity’s revenge against the hostile Martians, Serviss made the unusual choice of including both himself and famed inventor Thomas Edison as characters in the story. According to page 204 of Glenn Yeffeth’s contributions to The War of the Worlds: Fresh Perspectives on the H.G. Wells Classic (the Google Books preview for which is sadly no longer available online), he actually made a personal visit to Edison to get his approval for his role in the story. He agreed, perhaps influenced by how the last literary project he was involved in ultimately went nowhere. However, it is also claimed that Edison was less than pleased when the newspaper apparently implied that he helped write the story. The next page also wisely notes that the “Earth strikes back” theme of Edison’s Conquest of Mars misses the point of Wells’ original tale. In it, he presented England with an advanced, uncaring enemy that sought to conquer with such single-mindedness as to immediately attack without any attempt at communication. In other words, a force that gave the imperialistic British empire a taste of its own medicine. It also attacked the idea that “natural order” or the ideas that one race was more advanced than others (and should thus rule over them) promoted by Social Darwinism. Compare that to the quotation noted here, where Serviss basically uses the very sort of logic Wells was criticizing to justify Earth’s actions in his story! According to both Wikipedia and Yeffeth, Edison’s Conquest of Mars was the first literary work of science fiction to feature disintegrator rays, alien abduction, spacesuits, interstellar combat and aliens being responsible for the construction of the pyramids. Even with Edison’s reputation as the “The Wizard of Menlo Park” (due to his association with the then mind-blowing inventions of the light bulb and phonograph) in mind, the idea of him constructing spaceships and rayguns with the technology of the time does seem pretty ridiculous to modern readers. Even today, we’d laugh if someone tried writing a story where Dean Kamen fought off an alien invasion. Perhaps this is why several reprints of the story removed his name from the title? In any case, those who are familiar with the fact that many of “Edison’s” inventions were just modifications of preexisting devices will undoubtedly smirk over the reference to Edison studying Martian technology left over from the original invasion prior to developing his own spacecrafts. Given his rather adversarial relationship with Nikola Tesla, it’s easy for those “in the know” to joke about the disintegrator ray being lifted from Tesla. Come to think of it, the sequence in which Edison nonchalantly disintegrates a crow contradicts his stated philosophy of nonviolence, both in terms of the treatment of animals and the creation of weaponry. Then again, he had no problem electrocuting an elephant (and filming it) to promote the use of direct current, so maybe Serviss wasn’t too far off after all. But what about the story itself? Thanks to Project Gutenberg, you can read the entire story online (complete with the original illustrations)!